SEÑOR, SEÑOR, do you know where we're headin'? SEÑOR, SEÑOR, you know their hearts is as hard as leather. My wife and I had the pleasure to witness five performances of "SEÑOR" within 39 month from 1995 to 1998. It had been performed only a few times in 1999 and 2000, and only once in 2001, before Bob Dylan surprised an Austrian audience in April 2002 with the first ever acoustic version of this gem. In May 2002, just a few weeks later, Bob repeated this beautiful version in Manchester, and again my wife and I had the extraordinary pleasure to be a part of the audience during this faultless performance. 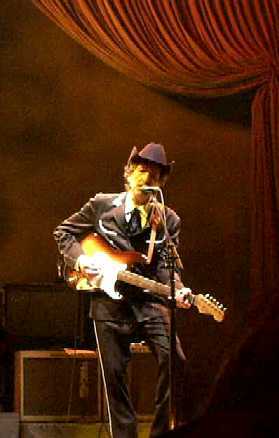 In August 2002 Bob performed "SEÑOR" in Halifax and Omaha. In October "SEÑOR" appeared in Eugene in the middle of the set, performed by Bob while playing piano. Both in Omaha and Eugene "SEÑOR" was preceded by "A VOICE FROM ON HIGH". Seven months later, in Florida, "SEÑOR" had its first appearance in 2003, again with Bob on piano. Three months later, in Joliet, Illinois, "SEÑOR" was performed in a Dead Set with Bob sitting in. Two weeks after that "SEÑOR" appeared in Bushkill, Pennsylvania; and four days after this Bob played "SEÑOR" in New York City. Already in the next show "SEÑOR" was performed again, in Gilford, New Hampshire, in the same set as "SAVING GRACE". One day after that "SEÑOR" appeared once more, in Syracuse, New York. During the European tour in the fall of 2003 "SEÑOR" was performed three times in Germany; in Hamburg, then in Leipzig, and two weeks after that in Freiburg. Next it appeared in the brilliant set list of the second show in Amsterdam, which also featured both the rare "TRYIN' TO GET TO HEAVEN" and the not so rare any longer "EVERY GRAIN OF SAND". Two days later "SEÑOR" was performed in Paris. The first performance of "SEÑOR" in 2004 was during the last of three shows in St. Louis, where this gem appeared in the same set as both "EVERY GRAIN OF SAND" and "SAVING GRACE". Almost two weeks later, in Detroit, "SEÑOR" was performed in the same show as "SHOOTING STAR". The next appearance of "SEÑOR", in Davis, California, was during the fall tour of 2004, more than seven months later, and once more it was performed in the same concert as "SAVING GRACE". The first appearance of "SEÑOR" in 2005 was in March, in Los Angeles, on Good Friday, as the second song in a concert which had started with "CAT'S IN THE WELL", and which also included "SHOOTING STAR", "STANDING IN THE DOORWAY", and "EVERY GRAIN OF SAND". During the first Sunday show of 2005, in Chicago, Bob Dylan chose to sing "SEÑOR" in the same set as "GOD KNOWS", "SHOOTING STAR", "TRYIN' TO GET TO HEAVEN", "A HARD RAIN'S A-GONNA FALL", and "I SHALL BE RELEASED", creating a very strong and thought provocing juxtopostion of some fine songs. More than three weeks after that, in New York City, "SEÑOR" was performed in the same show as "BLIND WILLIE MCTELL", "A HARD RAIN'S A-GONNA FALL", and "MISSISSIPPI". 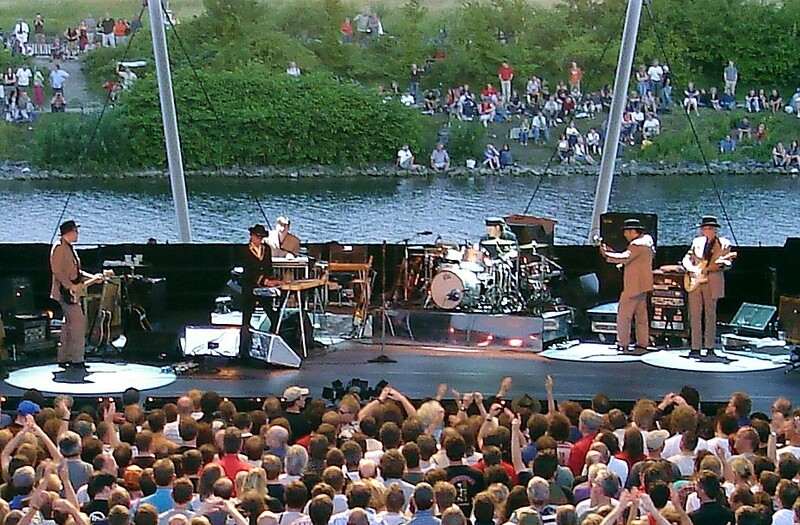 During the May to July stadium tour of 2005, "SEÑOR" was performed four times. In Ohio and Illinois it appered together with the typical Sunday songs for this tour, "GOD KNOWS" and "TRYIN' TO GET TO HEAVEN", in Maryland with "SHOOTING STAR"; and in Florida together with the only "CAT'S IN THE WELL" of the tour. During the fine European tour in the fall of 2005 "SEÑOR" appeared as the second song during all five Sunday concerts, in Wetzlar, in Erfurt, in Zürich, in London, and in Dublin. Every time it was followed by "GOD KNOWS". In Wetzlar these two gems shared a set list also with "A HARD RAIN'S A-GONNA FALL" and the only "SHOOTING STAR" of the tour; and in Erfurt also with "A HARD RAIN'S A-GONNA FALL" and the only "RING THEM BELLS" of the tour. In Zurich they appeared together with the only "STANDING IN THE DOORWAY" of the tour, and with one of the five fall versions of "EVERY GRAIN OF SAND"; and during the last show of the year, in Dublin, it appeared once more together with "EVERY GRAIN OF SAND". My wife and I had the pleasure to stand at the rail during three of those fine Sunday shows, (in Wetzlar, in Erfurt, and in Dublin), and to see and hear from a perfect vantage point these strong combinations of songs. From Aschaffenburg 1995 to Manchester 2002 we had seen "SEÑOR" already six times, but for me it is always special to hear Bob sing this gem. I was glad to hear it again in Wetzlar. In Erfurt, where it featured fine vocals and a very strong harp solo by Bob, "SEÑOR" was performed for the 9th time in my native Germany during the "never ending tour", and somehow my wife and I seem to be present more often than not. We saw both German appearances of this gem in 1995 (Aschaffenburg in March and Dortmund in July), both in 1998 (Nürburgring and Essen), and both on this tour. Only the three German appearances in 2003 we did not see. Three weeks later, back in Ireland, where we live since 1999, we saw another fine version of "SEÑOR", and as I agreed with Bob singing these lyrics in Wetzlar and in Erfurt, so I agreed with him in Dublin. "Let's disconnect these cables, overturn these tables. This place don't make sense to me no more. Can you tell me what we're waiting for, SEÑOR?" On July 2nd 2006, in Gelsenkirchen, Germany, I had the pleasure to witness the first appearance of "SEÑOR" of the year, which was even more surprising being performed by Dylan as the fourth song, as it usually appears as song number two. It featured very fine vocals and a strong harp solo, and was performed in the same show as the first appearances of both "NEW MORNING" and "FOREVER YOUNG" in 2006. During the fall tour of 2006 "SEÑOR" was performed in nine of the 29 shows; and during the European spring tour of 2007 "SEÑOR" appeared only once, in May in Leipzig, with Bob on electric guitar. During the North American summer tour of 2007 "SEÑOR" appeared only once as well, in Tuscon; and during the North American fall tour of 2007 "SEÑOR" was performed twice in September. In February 2008, "SEÑOR" was performed in Dallas, Texas, during the third of three warmup shows for Dylan's Latin America tour; and in 2009 "SEÑOR" appeared in Sweden in March, and then four times in the USA during Dylan's minor league baseball stadium summer tour. During the fall tour of 2009 "SEÑOR" was performed only once, in Utah. The first appearance of "SEÑOR" in 2010 was in March, in Osaka, Japan; and the next two were in June, in Viareggio, Italy, and in Barcelona, Spain. Six more times "SEÑOR" was performed in the US from August to November 2010. In April 2011 Dylan chose to perform "SEÑOR" once in Hong Kong, and three times in Australia, each time as the second song in the show, following "GONNA CHANGE MY WAY OF THINKING".